Our transformation into Christ is realized with the grace of the Holy Spirit and with our own free choice. This is the process of theosis, of our sanctification and growth in holiness. This is the road that leads to our union with God. It is the integration of our life into Christ. Within the Church a constant struggle and an unending journey to be with God is realized objectively, through participation in the holy mysteries of the sacraments, by the exercise of virtues, through prayer, and in love. This journey of ours is a journey of hope on which we embark under the direction of love. Jesus Christ is at this very moment living within us and is using us, to the degree that we surrender to His leadership, to effect a transformation of our material world into a unified sacrifice of praise and glory to His Heavenly Father. In the Baptism in the Jordan the Holy Spirit descends on Jesus and remains with Him. The heavens are opened and they are not closed. Jesus acts through the Holy Spirit. The Holy Spirit empowers Jesus to break through sin and death. After His Resurrection, Jesus ascends and is given a new relationship to His Father and to us and our entire material world. Darkness has no place when Christ sits at the right hand of the Father. Through Christ, the Father sends the Holy Spirit. God now communicates Himself to us in our darkness by the bright light of His fully realized Word ~ Jesus Christ. Into the dark silence of our inner world the brightness of Jesus enters. Whoever truthfully and genuinely loves God and their brothers and sisters as well with a holy passion, enters into the divine light. "The one who continues in the light is the one who loves their brothers and sisters; there is nothing in them to cause a fall" (1 Jn 2:10). The love of God and the love of human beings are not two loves, but rather, two aspects of the one and only true love, which leads to light. Love is transformed into light by the action of the Holy Spirit. We pray during the Vespers of Pentecost: "The Holy Spirit is Light, and by nature the giver of Light; He is All-holy and the Source of Holiness. Through Him, we know the Father, and glorify the Son, understanding that the Holy Trinity is a single Power, Three of equal rank and equally to be worshipped." United with divine love, we become enlightened as well. 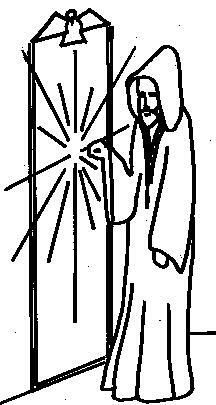 And being filled with the Eternal and Uncreated Light, we are enabled to enter into the Kingdom of God. In the Kingdom the light of the Holy Trinity shines in the heart of every Christian, for we have been "sealed in the Holy Spirit." All who walk the road of theosis, who obtain this divine light, will shine like new suns in the divine Kingdom. We are constantly transfigured by the Holy Spirit who bestows this light in order to form us into the likeness of Christ. "From the moment we are baptized, the soul, being cleansed by the Spirit, shines more brightly than the sun. Nor do we only contemplate God's glory, we also receive His brightness. It is as when pure silver is exposed to the sun's beams, it itself becomes shining, not merely because of its own nature, but due to the brightness of the sun." The Apostle John writes, "Eternal life is this: to know You the only True God, and Him whom You sent, Jesus Christ" (Jn 17: 3). The supreme blessing of the human soul is that it can know God. The supreme tragedy is that, distracted by the things of this world, it does not often want to know Him, To know God is not just another kind of knowledge: it is a matter of life or death; heaven or hell. Archbishop Joseph Schmondiuk of Philadelphia once related an incident that impressed him greatly. He said that each morning when he walked along the street from his home to the chancery office, he noticed a well-dressed gentleman sweeping the street. The gentleman always respectfully greeted the Archbishop. One day the Archbishop asked the man why he was always dressed so well for such a menial task. "I do this work for God," he replied, "I must dress my best and do my best when it is for Him." Let us echo those same sentiments about our tasks. May we look our best and do our best ~ whatever the task ~ because it is for God. One of the greatest universities in America was founded on the principle that there is no higher knowledge than to know God. John Harvard left his entire library and half of his estate so that a college bearing his name might be established. Harvard University was founded on this principle set forth in John Harvard's will: "Every student in this college shall be plainly instructed and earnestly pressed to consider the main ends of life and to know God and Jesus Christ, whom to know is eternal life." We read in Jeremiah 9: 22-23, "Let not the wise man glory in his wisdom, nor the strong man glory in his strength, nor the rich man glory in his riches; but rather, let him who glories, glory in this, that in his prudence he knows Me, knows that I, the Lord bring about kindness, justice and righteousness on the earth; for with such I am pleased, says the Lord." All of life is lived in the "now." Today is the only day you and I have to serve the Lord. Christ said, "We must do the deeds of Him who sent Me while it is day. The night comes on when no one can work" (Jn 9: 4). Today is the first day of the rest of your life. Today is the only day we are given the opportunity to work for the Lord. We don't get to choose how we are going to die, or when. We get to decide only how well we are going to live. Grandma said that she heard the incident of the gentleman who wished to travel to Chicago. He boarded a bus, and after a long day's journey discovered that he was not in Chicago but New York instead. He unfortunately had boarded the wrong bus. This story illustrates that desires and intentions alone do not achieve our goals. Goals are successfully met by the roads we actually travel in the right direction. Examples of persons headed in the wrong directions abound in our society. No one wants to suffer from heart disease, but millions of us live overly stress-filled lives and consume salty, fat-laden foods. Grandma is sure that no one intends to become an alcoholic or a drug addict, but millions follow the road of self-medication with alcohol and drugs that ends at that destination. We all wish to live lives filled with gratitude and joy, yet so often we choose to harbor thoughts and feelings of resentment that lead to remorse. We take the wrong bus and end up in the wrong direction. Christ calls us today to change our direction. Like the prodigal son of the parable, Christ says to us: "Get up quickly and return to Your Father's Home." There is a story of a monk who knocked on the door of heaven asking to be admitted. A voice from inside asked, "Who are you?" The monk replied, "It is I." The door did not open. After many years the monk went back to the door of heaven and knocked again. The same voice responded, "Who are you?" Again the monk replied, "It is I." The door remained closed. After many years, the monk, now older and wiser, approached the doors of heaven and knocked. When the voice asked, "Who are you?" the monk replied, "You in me.' Immediately the door of heaven was opened to the monk. Many answers may be given to define a Christian. A person who acknowledges Jesus as the Son of God. A person who patterns their life after the teachings of Jesus. A baptized person belonging to the Church. All these are fine definitions, but they are not complete because they have left out the single most important thing about the true Christian ~ the one in whom Christ lives. You in me! Jesus expressed this reality when He said: "I am the vine, you are the branches. He who lives in Me and I in him, will produce abundantly, for apart from Me you can do nothing" (Jn 15: 5). Two processions are high points of our Divine Liturgy. In the first, Christ enters into the midst of the community as the priest gloriously carries the Book of the Gospels around the altar and into the nave of the church. In the second procession, called the Great Entrance, the priest carries the holy gifts of bread and wine to the holy altar. 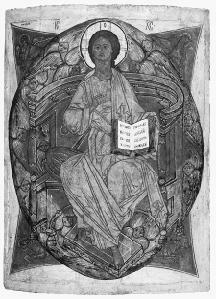 During the Great Entrance we sing: "Let us who mystically represent the cherubim and sing the Thrice-holy hymn to the life-creating Trinity, now lay aside all cares of life." This prayer proclaims that through divine grace, we have become representatives of the angels in heaven. We are called to identify with them for we are already in heaven at the liturgy. During this transforming moment, we need truly to release ourselves ~ putting aside all the tension, stress, concerns and worries that crowd into our daily, mundane lives ~ freeing ourselves of everything that does not have God as its unique focus. In placing the holy gifts on the altar, we place ourselves and all the needs of all the people on the holy table and present them to God in Christ. We remember all the faithful in need ~ bishops, priests, leaders of the nation, the sick, the suffering, the persecuted and the dearly departed. The Holy Spirit enlightens and graces us. Our encounter with Christ will enable us to share the light of Christ and change our world. At the consecration of the Liturgy the priest prays over these offered gifts: "Send down Your Holy Spirit upon us and upon these Gifts here present. . . . Changing them by Your Holy Spirit. So that they may be for the communicants sobriety of soul, forgiveness of sins, fellowship of Your Holy Spirit, fulfillment of the kingdom of heaven, confidence before You and not for judgement or condemnation."